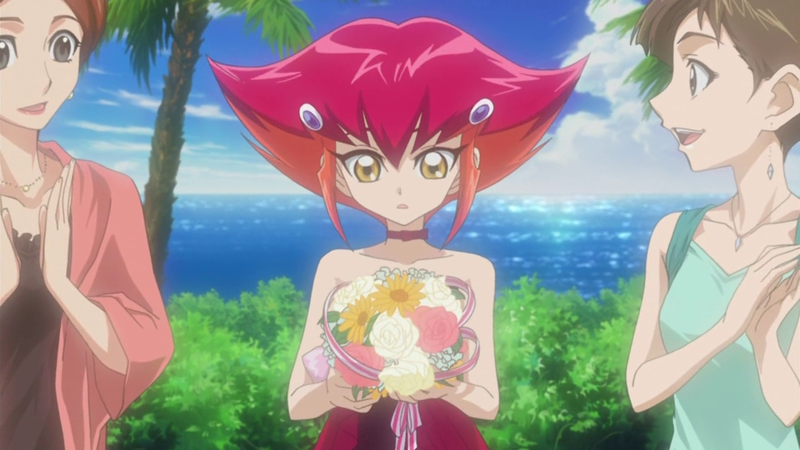 Anna Kaboom, known as Anna Kozuki (Kōzuki Anna) in the Japanese (and Italian) versions, has red hair, styled in a manner similar to Jaden Yuki’s. 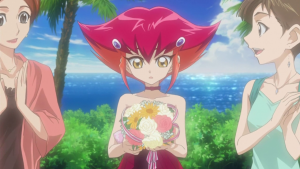 Her usual attire is a pink and white shirt, which reaches below her waist, black pants and a pair of boots in the same colors as her shirt. Anna is also shown to be quite hotheaded and reckless, often rushing into things without thinking the situation through. 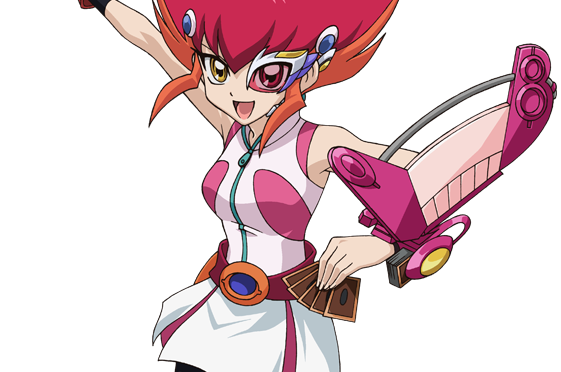 Her Dueling style is very reckless (using up her entire hand in the second turn) but also very calculated (being able to push her opponent in a corner in only the third turn), which coincides with her personality. Anna has also displayed a degree of selfishness, seen when she had difficulty working together with Yuma. 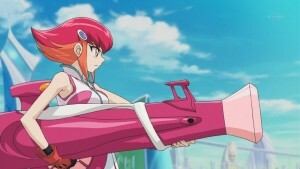 Anna carries a powerful cannon with her that can fire multiple shots at once. This weapon can transform into a hovercraft, which Anna can use as transportation to get around, while still retaining its ability to fire. Anna was taught how to Duel by Brooke Walker. She promised Anna that if she could beat her, then she’d do what ever Anna wished. 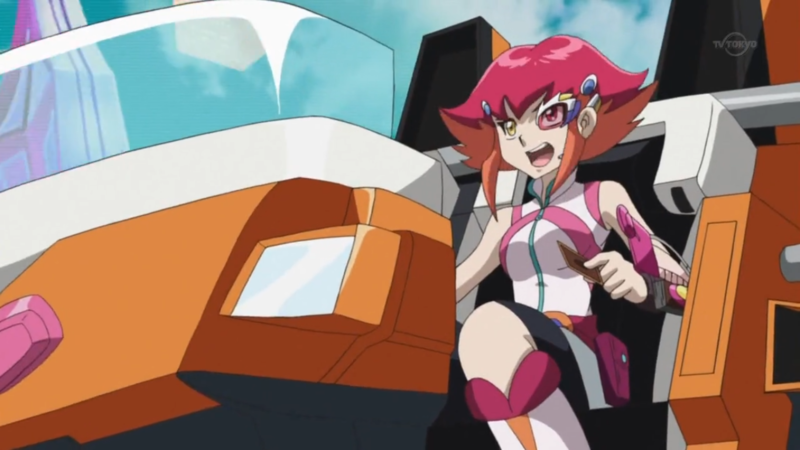 Anna uses a Railway Deck primarily focused on Xyz Summoning her “Superdreadnought Rail Cannon Gustav Max”. As that card is Rank 10, Anna utilizes several cards to easily access it such as “Night Express Knight” and “Southern Stars”. She also supports it with cards such as “Train Connection” and “Upgrade”. 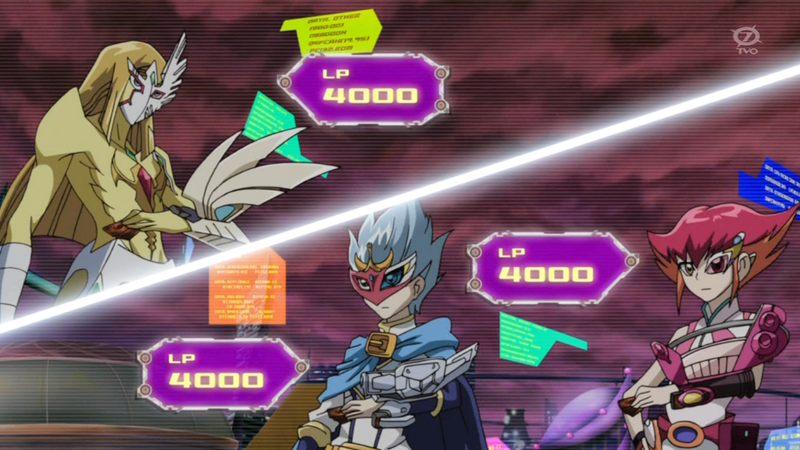 Anna’s Dueling tactics have been described by Astral as reckless but calculated.